If you plan to participate in a Championship conducted by the Pennsylvania Golf Association, it is important that you read the following information. It is your responsibility to know the rules and regulations concerning participation in Pennsylvania Golf Association events. Tournament policies of the Pennsylvania Golf Association are summarized herein to answer questions that may arise. Except in the case of special rules, which may be posted by the Executive Committee, Championships and qualifiers will be conducted under the rules of the USGA. All questions shall be directed to the PGA Executive Committee, whose decision is final. Membership is open to any organized golf club, golf course or golf club without real estate, located within the Commonwealth of Pennsylvania with at least 10 individual members who have a reasonable and regular opportunity to play golf with each other; are able personally to return scores and scorecards for handicap posting and elect officers to supervise golf activities and maintain the integrity of the USGA Handicap System. An individual may become eligible to compete in events administered by the Pennsylvania Golf Association by establishing a USGA Handicap Index at a Pennsylvania Golf Association member club. Visit the golf professional at a course near where you work or live that is a member of the Pennsylvania Golf Association. An Amateur player who is a RESIDENT of the Commonwealth of Pennsylvania may join as an Individual Member of the Association, as long as he has a verifiable Handicap Index. Please see the Membership Menu for more information on the Individual Membership. The Pennsylvania Amateur, Junior and Open Championships are “walking only” competitions. Players shall walk at all times during a stipulated round. The use of golf carts will be permitted during the championship qualifiers, Dressler, Four-Ball, Art Wall, Middle-Amateur, and Senior Championships. Competitors are required to pay cart fees for all qualifiers and competitive rounds where the use of golf carts is permitted. Only participants and their caddies may ride in golf carts. SPECTATORS ARE PROHIBITED FROM USING GOLF CARTS REGARDLESS OF THE AVAILABILITY OF SEATING. Walking spectators are always welcomed at Pennsylvania Golf Association Championships. However, for qualifying events, you should contact the course assigned regarding their policy. NOTE: During “walking only” competitions the Committee will have the right to assist players with automotive transportation, at their discretion. During a “walking only” competition, anyone seeking a golf cart due to a disability as defined under the Americans with Disabilities Act (ADA) should contact the Pennsylvania Golf Association at 610-687-2340, ext. 19, to obtain information on procedures for submitting such requests. All such requests and required information must be submitted to the Pennsylvania Golf Association together with the entry application, all of which must be submitted in writing by no later than 4:30 p.m. on the closing date. Please note that all requests due to temporary injuries or impairments that do not qualify, as a “disability” under the ADA will not be granted. The Competition is deemed to be closed when the trophy has been presented to the winner or in the absence of a prize ceremony when the results have been sent to the media. 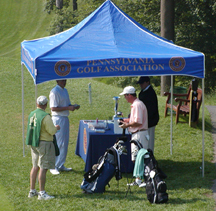 A player's entry may be withdrawn from the competition at any time (including during the competition) at the discretion of the Pennsylvania Golf Association Championship Committee for false statement of handicap index, unbecoming conduct, including profanity, club throwing, damaging of golf course property and refusal to comply with dress code. A violation will be considered a serious breach and result in disqualification under Rule 33-7. The optional condition as prescribed in Appendix I of the Rules of Golf is in effect. All practice areas are closed during suspension for a dangerous situation until the Committee has declared them open. One prolonged note of an air horn - Discontinue Play Immediately. Three consecutive notes of an air horn - Discontinue Play, Players may finish their hole if they had begun that hole prior to the discontinuance of play. Two short notes of an air horn -Resumption of Play. For play in all Pennsylvania Golf Association Championships and Qualifiers, a player may obtain distance information by use of a distance-measuring device. If, during a stipulated round, a player uses a distance-measuring device to gauge or measure other conditions that might affect his play (e.g., elevation changes, wind speed, etc. ), the player is in breach of Rule 14-3. Players and caddies employed by players are required to observe good taste and dress appropriately for the golf course. Items of clothing such as cargo pants and shorts (baggy clothing with large pockets in the knee area), blue jeans, short-shorts (bottom of shorts may be no higher than two inches from the top of the knee), tank tops, etc., are considered inappropriate. Hats must be worn in their “traditional” style (brims to the front). Anyone dressed inappropriately will not be allowed to participate in an Association event. In order to be a participant in the Pennsylvania Golf Association's Amateur, Art Wall, Dressler, Four-Balls, Junior Boys', Match Play events, Middle-Amateur, Open (for Amateurs), Senior Amateur, and R. Jay Sigel Championship you must be a male amateur golfer who is a member of a club belonging to the Pennsylvania Golf Association, or an Individual Member of the Pennsylvania Golf Association. Individual Members must reside in the Commonwealth of Pennsylvania. For Professional golfers, in order to be a participant in the Pennsylvania Golf Association's Open Championship you must be a resident in the Commonwealth of Pennsylvania, or be employed at a Pennsylvania Golf Association Member Club. As of 2017, all entries must be processed online at www.pagolf.org. For any questions, please call 610-687-2340 x19. The appropriate entry fee shall accompany every entry. All entries must be received at the Pennsylvania Golf Association Office by 11:59 p.m. on the entry closing date. Late or incomplete entries will not be accepted. Entries by telephone, fax or e-mail will not be accepted. Late entries may be subject to an additional fee. Player's who are exempt for a specific championship and wish to compete in that event, must meet all eligibility requirements. Players who wish to compete in a specific event and are not exempt under the qualifying exemptions must qualify at one of the sectional sites. When a player fails to return a scorecard, withdraws during play without notifying an official and personally surrendering his scorecard to that official or fails to appear for their assigned time without notifying Pennsylvania Golf Association Officials and/or the host club, a letter will be sent to the player stating that he has been suspended from all Pennsylvania Golf Association championships for a period of one year including the following year's events for which the infraction occurred. The player will be permitted to compete in any event for which he is already entered. Suspension will then begin with any further entries received from said player. The player will be given two weeks to respond to the suspension letter in writing. Players who have applied to participate in a Pennsylvania Golf Association event and find it necessary to withdraw from an event for any reason MUST contact the Pennsylvania Golf Association office at 610-687-2340, ext. 19, or creighard@pagolf.org, prior to the event. If a player is withdrawing on the day of an event, please call the Pro Shop at the number provided on your starting time information. Only brands of golf balls on the most current USGA List of Conforming Balls may be used. The List is available upon request. Penalty for use of brand not on the List: DISQUALIFICATION. The so-called “One-Ball Rule,” The optional condition prescribed in appendix I of the Rules of Golf is NOT in effect for any Pennsylvania Golf Association event. Golf clubs on the latest list of USGA Non-Conforming Driving Clubs will be prohibited. A copy of the USGA Non-Conforming Driving Clubs list will be available at the starter's table prior to each round. The penalty for use of a non-conforming golf club, or for having one in your golf bag, is DISQUALIFICATION. The new rules regarding grooves will be adopted as a condition of competition for the 2012 U.S. Open Championship and U.S. Senior Open Championship, as well as sectional (final stage) qualifiers for these championships. The condition will NOT be in effect at local (first stage) qualifiers for the 2012 U.S. Open or at any of the USGA's national championships and team competitions that are contested by amateurs only. It will be in effect for the U.S. Senior Open Qualifier (because there is no local qualifying stage). Therefore, the condition of competition WILL BE in effect for the U.S. Senior Open Qualifier. Other than the Men's Four-Ball Championships (lowest team combined index) and Women's Amateur Championship, entries will be accepted on a first-come, first-serve basis for all Championships. Entries after the field is complete will be placed on a waiting list in the order they were received. All entries are accepted for a Championship requiring qualifying (Amateur, Middle-Amateur, Open). Entry into a qualifying site is on a first-come, first-serve basis. If a qualifying location has more players than can be accommodated, some players may be transferred to another location. The date for qualifying may be different than the original date requested. All transfers are final. The PAGA staff, following as closely as practical the preferences indicated on the entry blanks, will determine pairings and tee times. Contestants will be notified of starting times by e-mail. The “Official Time” will be maintained at the starting tee(s) only. Starters will not page players in advance of their starting time. Players should report to the tee one starting interval prior to their tee time. All players must be present and ready to play at the time laid down by the Committee. In the event of a tie for first place in any gross division championship, there will be a sudden-death playoff immediately following the conclusion of play. In the event of a tie for the Junior Boys' Team Championship, the fourth score from the final round will be added to the total team score. If a tie still exists, the fourth score from the first round will be added. If a tie still exists, the final round team total will be used. If a tie still exists, the low individual score for the final round will be used. If a tie still exists, the next low individual score for the final round will be used and so on. Teams with only 3 players will suffer defeat against a team with 4 players for failure to have a fourth score. In the event of a tie when determining the awarding of prizes (flags), a scorecard playoff will break the tie(s), starting with the final-round score. If a tie still exists, the back nine of the final round will be used. If a tie still exists, the last six holes of the final round will be used. If a tie still exists, the score on the last three holes will be used. If a tie were still to exist, the score on the 18th hole will be used and so on counting backward. If such method is used in a competition with a multiple tee start the “back nine, last six, and last three” is considered to be holes “10-18, 13-18 and 16-18”. All gift certificate payouts will split prize money. Duplicate crystal will be awarded for Runners-Up. The Pennsylvania Golf Association WILL NOT have a sudden death play-off to determine the final qualifying positions for Championships. The Association will be taking the number of qualifying positions allocated for the qualifying site and ties to the championship Proper. The Association encourages our host facilities to provide practice rounds. Practice round information will be made available after the close of entries (See Event Home Page or Player Information). NOTE: Not all host facilities will provide practice rounds. We apologize for any inconvenience this may cause. The Pennsylvania Golf Association protects the privacy and confidentiality of its Members and does not provide or sell information to third parties. General personal information, i.e. name, address, email, etc., may be used by the Association to keep Members informed about member benefits, programs and services. No credit card, financial or other personal identifying information is provided to third parties. Entry fees will be refunded regardless of reason if the Pennsylvania Golf Association is notified prior to close of entries. After the close of entries, the entry fee will be refunded only in the event of illness, injury or a death in your immediate family, if requested in writing by the start of the championship. For a refund to be considered because of illness or injury your letter must be accompanied by a doctor's note. Refunds will be sent after the completion of the championship. All refunds will be returned less a $25 administration fee. (Immediate family will include parents, grandparents, children, brothers, sisters, aunts, uncles, nephews and nieces). All checks returned to the Pennsylvania Golf Association due to insufficient funds will carry a $30 service charge. Complete entry fee amount and service charge must be received by the Pennsylvania Golf Association before a player will be allowed to compete in that event. 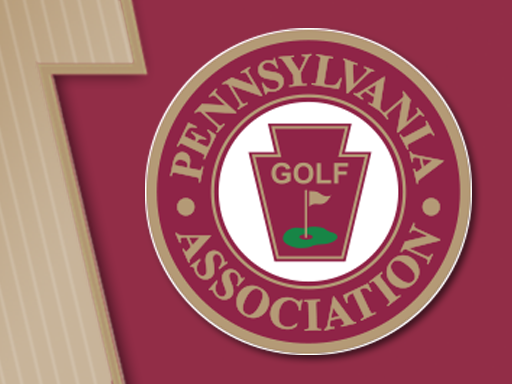 Players who have been accepted as participants in Pennsylvania Golf Association championships will receive event information concerning course assignment, practice rounds, pairings and starting times approximately seven days prior to the event. If you have not received your information seven days prior to the event, it is your responsibility to contact the Pennsylvania Golf Association. Information can also be found at www.pagolf.org. If a Championship/Qualifying course is declared unplayable and as a result it is not possible to complete play in the period in which the Championship/Qualifying is scheduled, the Championship/Qualifying shall not be extended beyond the last scheduled day and the winner/qualifiers shall be the individual(s) which returns the lowest score for the number of stipulated rounds played. The Committee may institute a change in the cut format in order to play the last stipulated round. All players/caddies are advised that the use of cellular/Smart phones for phone calls/emails/texts/messaging on the course is permitted as long as it is done so within the confines of Rule 14-3 and if the host facility allows those devices to be used. The Association will provide the host club policy on the GAP Website and in the Player's Information sent with the tee time. All players are expected to keep their phones in silent mode while on the course. If a player consistently disregards his fellow competitors or opponent to their detriment, the Committee will take appropriate disciplinary action. Such action may, for example, include prohibiting play for a limited time or in a certain number of competitions. In the case of a serious breach, the Committee may disqualify a player under Rule 33-7. There could be a penalty for undue delay (Rule 6-7) or disqualification (33-7) based on a player's actions. Golf is considered a gentleman's game and each player is expected to adhere to the highest standards of conduct on the course.